I’m very fond of my Proxxon MF70. I converted it myself and its what got me into the whole world of CNC. It’s great but the size does limit what it can do. Since getting a new workshop I’ve been thinking of what to fill it with. Actually, that’s not quite true. I had an idea of some things to fill it with before it was even built. I just couldn’t buy them. I’d been keeping an eye out for a bigger CNC mill for a while. Whilst I did consider a “proper” mill like a Sieg X3, these are really heavy, expensive and needed a lot spent on CNC conversion. To be honest, whilst it’s nice to be able to easily mill large chunks of metal I knew I wouldn’t be doing it all that often. I’d learnt from tinkering with my CO2 laser cutter that cheap Chinese machinery is good value if you’re prepared to improve their shortcomings. 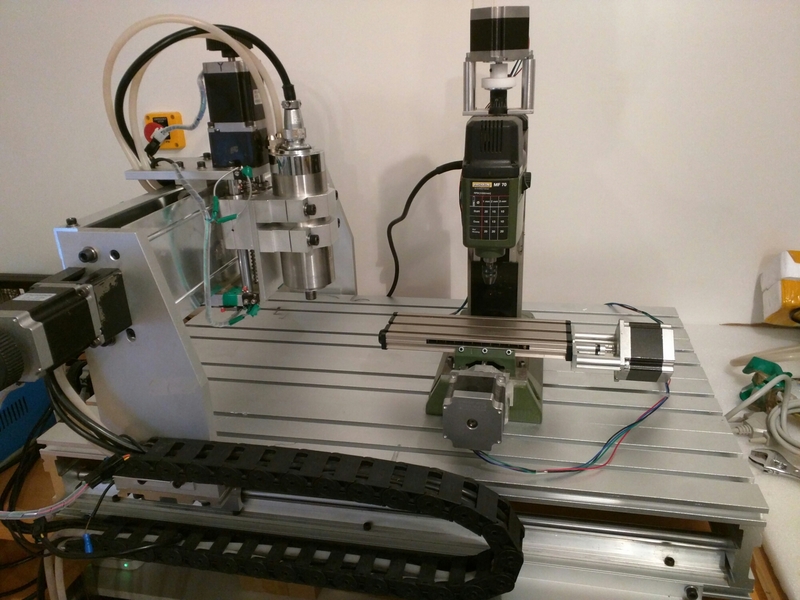 The popular eBay CNC3040 or CNC6040 machines definitely fall into this category. It’s more of a router than a mill, but is apparently capable of machining aluminium if you’re careful. I’d been watching for a while and some went for silly prices near the £1000 or so new price, so I was happy to snap one up for £615 including a few upgraded controller components. It had a slightly damaged table no doubt from some missed Z steps. slowly ramping the endmill into it. It had the older blue (total junk) controller box which I was going to replace with a Gecko 540 I had hanging around for just this sort of thing. It has the older Huanyang VFD to drive the water cooled spindle but it seems this is easier to control using Mach3 than the newer Nowforever ones. It arrived and I unpacked it. It’s so much bigger than my old mill. The spindle alone is about as big as the old table! I was a little disappointed to find that the table was a bit worse than it looked in the photos, but I carefully filed it down so it was at least flat and turned the T-slot pieces around so the damage wasn’t in the centre. The bigger shock was the badly stripped threads on the main gantry assembly and the horribly bodged limit switch wiring. Oh well – nothing a little time and care wouldn’t sort out. I fired it up using the blue box. One axis tended to freeze in one direction. It seemed to be the controller board rather than the stepper drivers. Switching to another of the 5 channels helped but it still missed steps occasionally. Moving from 16 to 8 microsteps helped again, but then it started really misbehaving. Time to ditch it and go Gecko. I’m not going to waste any more time putting lipstick on the pig that is the electronics. I’ll replace all the wiring with shielded stuff too.